WILD SARDINES IN EVOO, LIGHTLY SMOKED - Wild caught sardines in organic olive oil and lightly smoked for a delicious, full flavor. RICH IN NUTRITION & FLAVOR - A nutritional powerhouse, Wild Planet sardines are an essential source of omega 3, protein, calcium, and iron. FROM THE NORTH PACIFIC - Feel confident that the sardines you're enjoying are harvested in the Pacific with sustainable methods, making them healthy for the Earth and your body. 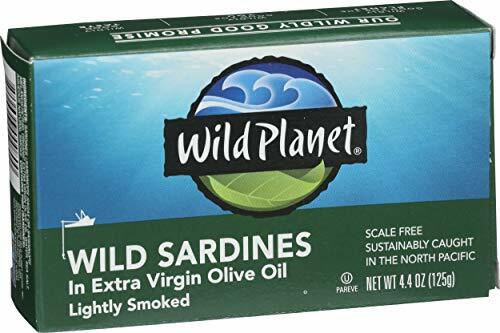 SUSTAINABLE & NON-GMO - Wild Planet Sardines are 100% sustainably caught via free school purse seine methods, and are Gluten free, non-GMO, OU Kosher Pareve. WILDLY GOOD - Wild Planet Foods is dedicated to maintaining the ocean's natural ecosystem while providing delicious, healthy and sustainable wild seafood. Final Price as low as $23.69 Shipped!